Available at Scooter Crazy Ltd, Mon-Fri, 9am-5pm! It is essential that you service your scooter at the times specified in your scooter manual. There are several reasons for this, the first being that you could void your warranty if you don't keep up to date with servicing. The second being that it keeps your scooter performing at the level it should. And finally, it is more appealing to potential buyers in the future should you wish to sell your scooter if it has a full service history. There are three levels of service, the first service, intermediate service and major service. The tables below show service schedule and checklist details of our most popular scooters, when you should be bringing them for a service, the cost and what the service involves. Often you can sit and wait for your service to be done, have a coffee or grab something to eat at the cafe across the road whilst the work is being carried out. 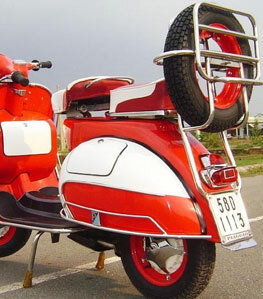 If you want to book your scooter in for a service you can email us or telephone 01226 203377. We recommend you allow up to 5-7 days notice during the summer months (although we will attempt to fit you in sooner if possible).